12/17/10: The Futures Collegiate Baseball League will join the New England Collegiate Baseball League and the Cape Cod League as an option for active collegiate baseball players with high aspirations to play during their summer break. The FCBL will feature as many as six teams in its inaugural season. All players in the league must be on college baseball rosters during the spring 2011 season to be eligible to play. At least 12 players on each roster must be from New England or New England-based schools. Clubs will use wood bats and play a 44-game regular-season schedule. Thus far, only the Matha's Vineyard Sharks and a team from Nashua, New Hampshire have been named. Those interested in learning more can visit: www.thefuturesleague.com. 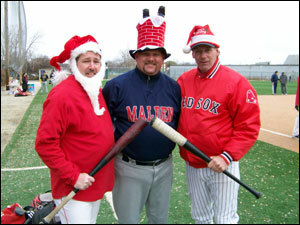 12/04/10: On a day when Red Sox Nation was involved in hot stove talks, amateur athletes from across Greater Boston were actually playing 9 innings of baseball - all to benefit Toys for Tots. U.S. Marine Sergeant Jonathan Chan was on hand to thank the athletes for their contribution, and root them on during chilling 41 degree conditions, that even saw a few flurries in the game's early innings. This year's game featured players from many local leagues, such as the Boston Men's Baseball League, Yawkey League, Park League, BABL, CNEBL and several others ranging as far south as Rhode Island and as far north as New Hampshire. Younger players came from high school and AAU teams, led by players on the New England Stampede. Festive Rob McDonough, Smokey Moore and James Barnes. 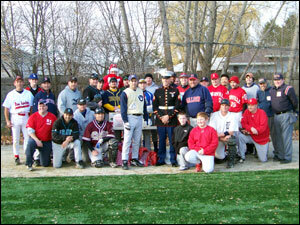 Winterballers with U.S. Marine Sergeant Jonathan Chan. 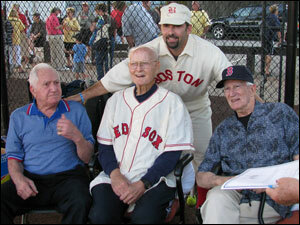 11/21/10: The Boston Yawkey League held their Hall of Fame dinner last night at IBEW Local 103 in Dorchester. The Somerville Alibrandis were honored for their championship season. Former Boston Red Sox GM, Dan Duquette, was the key note speake. HOF player inductees included Manny Delcarmen (South End Astros), Gregg Rockwell and Phil Davies (West Roxbury Devil) & David Zaslaw (Al Thomas A's). HOF "Builder" inductees included Ed Neal, Terry Alvord, and William K. “Billy” Cunningham. Awards were also given for League Honors, Gold Glove, Silver Slugger and Excellents & Appaeciation. Further south at The Lantana in Randolph, the Boston Park League was holding their Hall of Fame Dinner. The highlight of the evening was the induction of the Hall of Fame class of 2010: Tommy Anderson of Herb Connolly Club, Hal Carey of Stockyard, Albie Gould of Hal Crosby Club, Dan Rice of Towne Club and Sean Russell Palmer Club. The league also recognized players and alumni with Special Awards for outstanding achievement, as well as the 2010 All-Star team. Jerry Trupiano, former radio announcer for the Boston Red Sox, was Master of Ceremonies. 11/12/10: To celebrate Veteran's Day, Boston Red Sox Legend Curt Schilling welcomed original members of World War II’s most famous outfit, Easy Company, 506th PIR, 101st Airborne-the Band of Brothers for a panel discussion featuring the veterans and several of the Hollywood actors who played the soldiers in the popular HBO series at Veteran's Memorial Auditorium in Providence, Rhode Island. 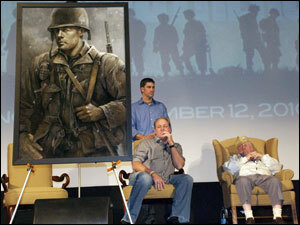 Local sports artist, Brian Fox, also unveiled his new painting of WWII hero Major Richard D. Winters. 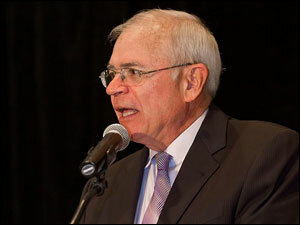 11/09/10: Joe Castiglione, the radio voice of the Boston Red Sox, hosted the New England Collegiate Baseball League Hall of Fame Tribute Dinner at the Boston Marriott in Newton this past weekend. Since 1994, the NECBL has been touted by Major League Baseball as one of the nation’s premiere summer collegiate wooden bat leagues with 29 alumni players currently in MLB. 2010 alumni inductees include the LA Dodgers' Andre Ethier, Colorado Rockies' Chris Iannetta, and former Boston Red Sox' Mark Malaska. The NECBL administrative inductees include Fay Vincent, former MLB baseball commissioner and NECBL President; and Joseph Consentino, NECBL Founder and EMMY award-winning television documentary filmmaker. NECBL Stand-Up Guy Award recipients are two former Boston Red Sox players, Bill Buckner and Skip Lockwood as well as former general manager Lou Gorman and manager Joe Morgan. HOF pitcher Robin Roberts is being honored posthumously for his contributions to the NECBL’s Vermont Mountaineers. His son Robin Jr. will accept the award. Honored for their charity work were Red Sox all-stars Bob Stanley (The Jimmy Fund) and Bill Lee (The Travis Roy Foundation), and Cincinnati Reds all-star George Foster (Foster Safe Youth Network Foundation). Watch video of Joe Castiglione at the HOF dinner. Also see the photo albums by Crowley Photos and Richard Rossiter. 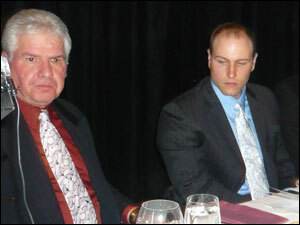 HOF'er Chris Iannetta of the Colorado Rockies. the NEBL Hall of Fame Dinner. 11/07/10: The Greater Boston Sports Collectors Club card show was this weekend at the Shriner's Auditorium in Wilmington, MA. Featured were more than 250 of the world's finest sports dealers. More than 30 MLB'ers were in attendance, including Johnny Bench, Carlton Fisk, Jim Rice, Dwight Evans and Fred Lynn. 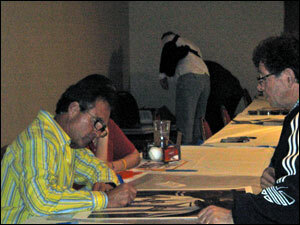 Red Sox legend Fred Lynn signs for a collector. Johnny Bench ready to meet his fans. 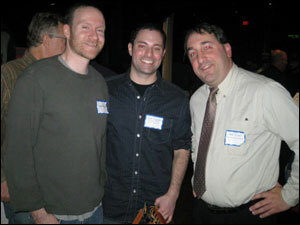 11/07/10: Boston Sports Blogapalooza II was held at the Baseball Tavern yesterday, and was the largest sports blogging networking event ever held in Town. Carolyn Mannon of Comcast SportsNet played host, and all your favorite writers were on hand. 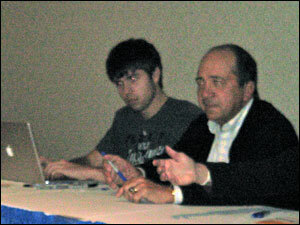 Panel discussions were held across all major sports, including scheduled for baseball: D.A. from 98.5 Sports Hub, Jared Carrabis from Sox Space & Tim D from Fire Brand of the AL. 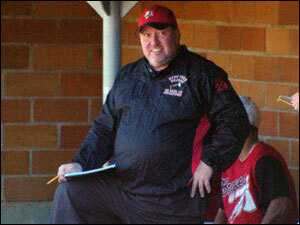 Check out his story in November's New England Baseball Journal: 'Pahking Cahs' at Fenway. 10/28/10: Last night at the Pour House in Boston, the Boston Men's Baseball League MABL division held their end of the season celebration. The Boston Blue Jays and Cambridge Spinners were honored for their top finishes. Top individual achievement awards were also handed out, including Adam Del Rio of the Cutters (Most Valuable Player), Kyle Buika of the Blue Jays (Cy Young), Chris Vecsey of the Orioles (Rookie of the Year) and Ryan Bere of the Blue Jays (Manager of the Year). 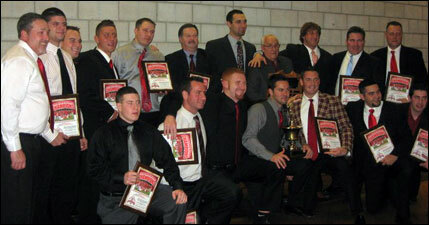 See the complete list of 2010 MABL Award Winners. 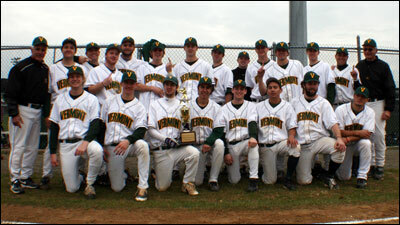 10/24/10: Congrats to the University of Vermont Baseball Club, who defeated Boston University, 9-6, yesterday to capture the 2010 New England Club Baseball Association championship! The BU Terriers had finished the regular season 8-3-1, while the Vermont Catamounts finished the season a perfect 10-0. 10/13/10: In an end-of-year celebration, the Boston Amateur Baseball League's Hyde Park Braves took to Cooperstown, New York at the Baseball Hall of Fame this Columbus Day Weekend to play games versus the Abington Pennsylvania Dodgers and New Milford Connecticut Black Sox. The Braves went 2-1 in the round-robin, beating the Dodgers 9-3 and 12-11, and losing to the Black Sox 10-8. The Black Sox finished play 3-0, while the Dodgers were winless. 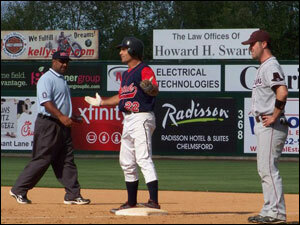 The Braves' highlight was a 3-run homer by Rolondo Marrero on Doubleday Field. 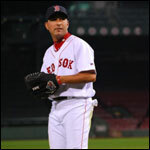 Many Boston teams have made the journey to the HOF this year, including the Somerville Alibrandis from the Yawkey League, the Wayland White Sox and Cambridge Cantabs from the MSBL, and 6 teams that battled in the Cooperstown Classic Tourney. See photos from the Hyde Park Braves trip vs. the Dodgers and vs. the Black Sox. 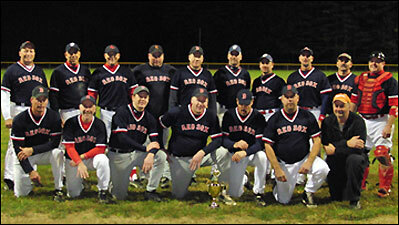 10/13/10: For the fourth year in a row, the Metro Red Sox captured the Boston Men's Baseball League 40+ Master's Division Championship, this time with a 2-0 sweep over the Waltham Braves. Game 1 was won by the Red Sox, 4-0, behind a shutout performance from pitcher Kevin Curtin. Game 2 was won, 8-5, to clinch the Best-of-3 series. 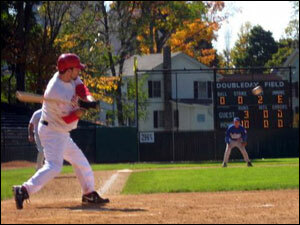 10/11/10: The 2nd Annual Seacoast NH MSBL Regional Tournament was held this weekend in Dover, NH. The Connecticut Mets won the 25+ division and the Maine Diamond Dogs won the 35+ division. The Boston Men's Baseball League's North Andover Thunde competed in the 35+ group and were defeated by the Diamond Dogs in the semi finals, 7-6. 10/10/10: Red Sox’ legend Curt Schilling threw his 7th annual 100 Innings of Baseball to raise money for ALS, better known as Lou Gehrig’s Disease. Curt named his son after Lou Gehrig. 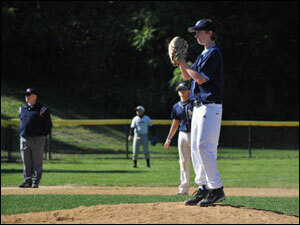 This year, from innings 96 to 99, the 15-year-old Gehrig Schilling took the diamond, joined by his Medfield teammates, as Curt Schilling managed the squad. The game was at Adams Field in Quincy, MA. 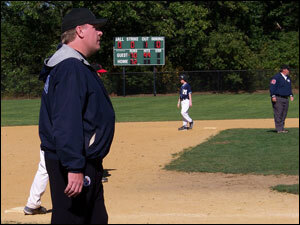 Curt Schilling coaches 3rd base. Gehrig Schilling on second base. Gehrig Schilling was thrown out at the plate on a bang-bang play in the top of the 99th inning attempting to gain the go ahead run. He then pitched the bottom of the 99th scorelessly to send the tie game to the 100th inning. Bryan Curran of the Yawkey League’s McKay Club Beacons was the only player to homer in the game, and he did it twice. Walter Bentson umpired an inning at exactly midnight, as has been his custom in the 100 inning game. Brent Campbell of the Men’s Adult Baseball League’s Blue Jays pitched the first 30 innings of the game and recorded 21 strikeouts. The approximate 150 adult amateur players playing came from more than a dozen amateur baseball leagues across Greater Boston. In addition to Team Medfield, the teenage players came from the Newton Central Little League team and The Stable Baseball Academy in Woburn. 19 “Iron Men” played all 100 innings. Read more. 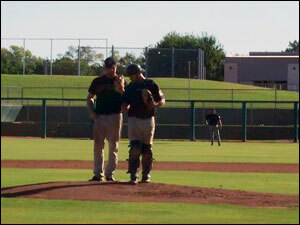 10/04/10: For the fifth year, the Boston Rockies competed in the highly competitive 18-Wood Bat division of the NABA World Series in Pheonix, Arizona from September 30th through October 3rd. The team had an explosive offensive lineup, and experienced pitching staff poised to do damage in the desert. 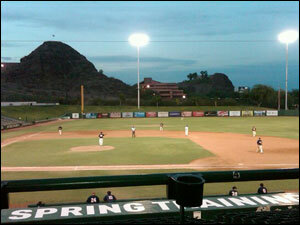 The entire tournament is played on Major League Baseball spring training fields. 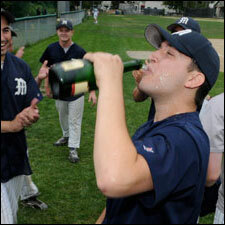 10/04/10: What better way to wrap up a Yawkey League season? Members of the 2010 Somerville Alibrandis and alumni from the Yawkey Baseball League headed to the Baseball Hall of Fame in Cooperstown, NY and played an exhibition on historic Doubleday Field. Final Score: 13-3. 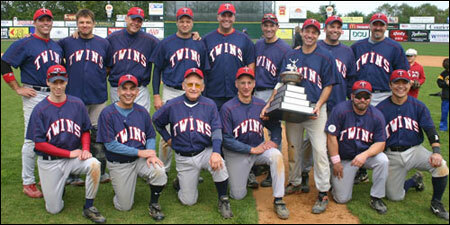 10/04/10: Congratulations to the Twins, back-to-back winners of the Over-Thirty Baseball (OTM) Championship. The Twins beat the Phillies, 11-2, behind the pitching of game MVP Paul MacGregor. 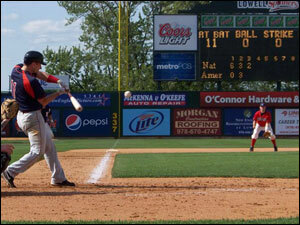 The game was held at LeLacheur Park, home of the Lowell Spinners, Single A Affiliate to the Boston Red Sox. 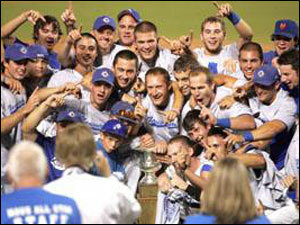 10/01/10: The Boston Blue Jays walk-off to win 3-2 versus the Cambridge Spinners for the 2010 MABL title. Going into the bottom of the 7th inning down 2-1, the Jays tie the score 2-2 with a sacrifice fly from Dana Levensaler scoring Jake Stewart who singled to start off the inning. Now with 1 out and a runner on first and Dakota Happas on second, Rob Linn hits a tailor-made double play, but he legs it hard and is safe at first. Meanwhile, Dakota scores all the way from second for the walkoff. Blue Jays take home their first MABL title. See many more videos. 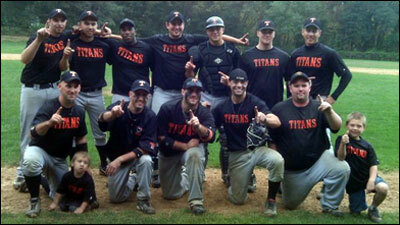 9/30/10: Manager Paul Grande and his Titans sweep the Royal Rooter Baseball League championship series from the Braves, 12-4, 12-5. The Titans hit 7 homeruns on the day, including 3 grandslams. Matt Boleski and Phil Costello both hit 3 home runs each. Mark Blake and Matt Smith both pitched complete game victories. 9/30/10: The Newton Red Sox defeated the Middlesex Brewers to win the MSBL American League Championship for the 5th time in the last 9 years. The Scituate Tides swept the Lexington Blue Sox in the MSBL National League Championship for their 4th title in the last 6 years. Learn more at bostonmsbl.com. 9/30/10: The the Central Mass Storm won their second straight Central Mass 40+ Fall Classic, this time defeating the Tobacco Valley Cubans, 11-2, in the finals. Other participating teams in the 12-team tourney consisted of the Aubuchon A's, Leominster Diamondbacks, Lithium Indians, Mass Minutemen, Nashua Tigers, Quincy Grays, Springfield Nor'Easters, Townsend Astros, Vermont Cats and Whalom Greys. 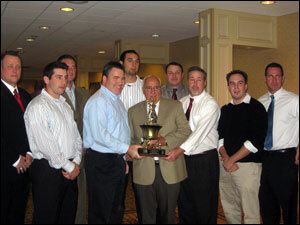 9/23/10: The Somerville Alibrandis, champs of the Yawkey Baseball League, were honored by the BoSox Club at its annual awards luncheon. Also honored were the city champs from the Park and Intercity leagues, Carlson Club and the Lexington Blue Sox, respectively. 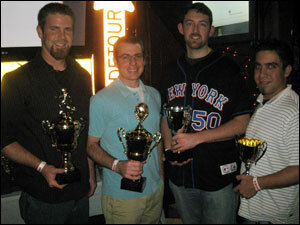 Plus, recognized for their 2010 accomplishments were amateur teams from across the region. Sponsor Tony Alibrandi with the Team. Walt Mortimer, Nick Faggas & Josue Feliciano. 9/20/10: The Framingham Orioles of the MetroWest ABL won their 10th league title in 17 seasons, defeating the Southborough Cubs. Both teams supported a 19-1 record coming into the title games, and both teams have met in the finals 6 times, each team winning 3 series. Framingham took Game 1, 6-1, with Kevin Allegrezza pitching a 9 inning gem. Eric Cormier did it all in Game 2. He pitched a complete game and hit a monster 360 foot solo home run to give the Orioles a 2-1 lead in the 7th. The final score in Game 2 was 3-1. “Pitching, defense and timely hitting were huge for us today. Kevin and Eric are our team Co-MVP’s and they both came through for us all year. Al Dayhoff, our catcher, was outstanding as well. 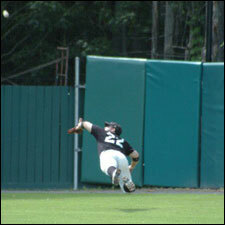 He led the team in hitting and was immense behind the plate,” commented shortstop Chris Currie. 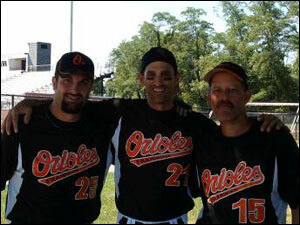 Framingham Orioles' Chris Currie, Tom Galvanni and Jeff Merzel. 9/15/10: The scene was Fenway Park, with Boston natives all around. The reason for the neighborhood gathering was to be part of a select few who got to take in the premiere of Ben Affleck’s latest film, The Town. Jared Carrabis, Governer of Red Sox Nation, gives his first-person account of the Red Carpet experience and his review of the the film. Jared Carrabis reviews The Town premiere. 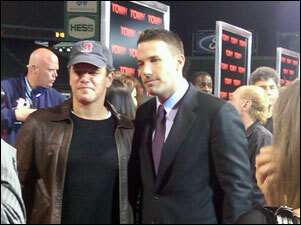 Matt Damon & Ben Affleck at The Town premier. 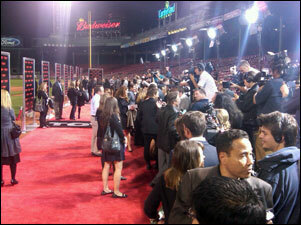 Fenway Park hosts the latest blockbuster Red Carpet. 9/08/10: The Somerville Alibrandis defeated the 2-time defending champion West Roxbury Bluefish in Game 5 of of the Yawkey League finals for their 11th title in 14 years. Three of the games in the series were 1-run affairs. In the final game, with Somerville leading 3 games to 1 and the Bluefish leading by a score of 4-1, the Alibrandis came back from a 3-run deficit in the final frame to tie the game 4-4 and force extra innings. Somerville then scored 3 runs in the 8th inning to seal the game, 7-4, and the series. 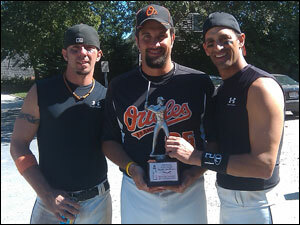 9/06/10: The Framingham Orioles of the Metrowest Adult Baseball League defeated the Connecticut Top Hats, 6-1, to win their 2nd straight Cape Cod Classic title. The 16th annual tourney was held Labor Day Weekend on the fields of the Cape Cod Baseball League – the country’s premier amateur collegiate summer league. Hurricane Earl cancelled games on Friday, yet teams made it back onto the fields Saturday sporting shirts that read "We Survived Hurricane Earl!" This year’s Classic showcased 14 teams from five states. Teams crossing state lines to participate include the Washington Monuments from Connecticut, the Merrimack Dodgers from New Hampshire, the Rome Dodgers from New York and the Burlington Black Sox from Vermont. 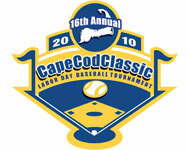 See the 2010 Cape Cod Classic schedule and participating teams. The Tournament MVP was shared by Framingham’s Eric Cormier and Al Dayhoff. Cormier won Game 2 by tossing 8 strong innings, and then closed the Championship game. Dayhoff caught every inning in the 5-game tourney, threw out 3 runners, had several hits, and was plunked by 3 pitches. 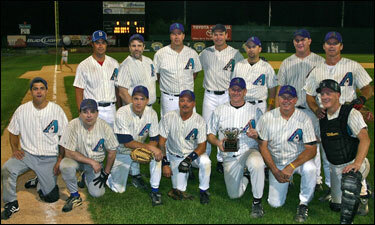 9/01/10: The Diamondbacks defeated the Mets, 9-7, at Holman Stadium in Nashua, NH to win the Lowell Night Over Thirty Basebabll Championship. 8/29/10: Last weekend at Evans Field in Rockport, the Manchester-Essex Mariners defeated the Rockport Townies in Game #4 by a score of 3-1 to clinch the north shore's Intertown Twilight League (ITL) Championship. For the Mariners, it was their 3rd straight championship. For the second time in the series, Steve Stout of the Mariners tossed a complete game allowing only 1 unearned run. Read more from the ITL Baseball article. 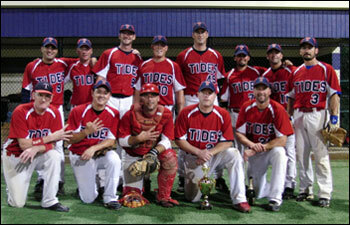 The 2010 Machester-Essex Mariners celebrate their 3rd straight championship. 8/27/10: In the 17th annual Oldtime Baseball Game at St. Peter's Field in Cambridge, MA, starting pitcher James Greeley earned MVP honors after leading the home team, sponsored by Bejoian Family Trust, to a 9-2 win over the away team, sponsored by Abbott Financial. Along with a solid effort on the mound, Greeley also drove in a pair of runs to become the first player in Oldtime Baseball Game history to win the MVP award twice. Greeley has played in the game six times, dating back to 2005. Read more from the New England Baseball Journal article. during player introductions last night. 8/27/10: Carlson Club defeated Palmer Club to win the Boston Park League Championship for their second straight year, this time under the leadership of rookie skipper, Nick Faggas. In the series, Wandy Rosario saved three of the four victories, as Carlson took the series 4 games to 1 in the best of seven. Pablo Reyes took the series MVP. 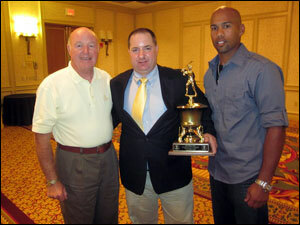 Chris Kline (left) is the Northeast Area Scouting Supervisor for the Pittsburgh Pirates. He said he logged 108,000 miles in 18 months scouting! Brian Porter, Director of Baseball Initiatives for MLB Advanced Media, gave a review of the challenges in working for a demanding boss and management staff under Chicago White Sox GM Kenny Williams. Dr. Chrystal Denmark Porter is the Assistant Dean of Sport Science at Endicott College and warns that sports management jobs are extremely limited after receiving a degree, so line internships up before graduating. The post-speech Q&A found the wine and beer flowing as fast as the conversations. Everyone was very candid and supportive. Thanks SupahFans for the photo. 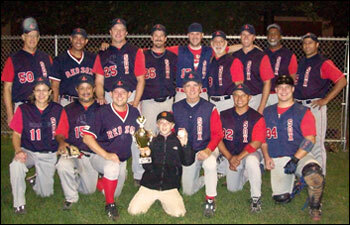 8/21/10: The Swampscott Sox were crowned North Shore Baseball League champions for the first time since 2006 with an 8-4 triumph over the Peabody Champions at Twi-Field in Danvers during the deciding Game 7. Prior, Peabody had won three straight titles, including the last two years against Swampscott in the Finals. Read the full article from the Salem News. 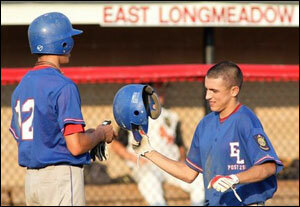 Peabody Champions' Ben Hart knocks fists with catcher Mike Giardi after finishing an inning. Swampscott Sox starting pitcher Fred Cole releases some heat for one of his many strikeouts in the North Shore Baseball League title game. 8/19/10: The Lexington Blue Sox won the Intercity League title for the eighth time in their 16-year history after beating the Watertown Reds, 7-1, at Lexington High School in a 3-game sweep of the Best-of-5 series. Read the full article from the Lexington Patch. 8/13/10: We are fortunate in New England that two of the top NCAA sanctioned collegiate summer baseball programs in the country are in our back yards: The New England Collegiate Baseball League and the Cape Cod Baseball League. Congrats to our 2010 champions! Cotuit Kettleers, Cape Cod League: The Kettleers capitalized on four Yarmouth-Dennis Red Sox errors to cruise to a 6-0 win in Game 3 of the best-of-three series and capture their first title since 1999. 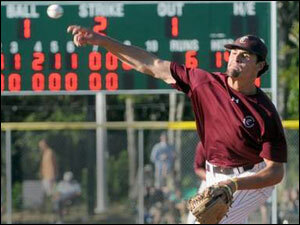 Cotuit pitcher Nick Tropeano, didn't allow a hit and struck out seven over 6 2/3 innings. Read the full article from the Cape Cod Times. North Shore Navigators, NECBL: The Navs claimed their first NECBL title with a dramatic win, 5-4, over the Danbury Westerners. The Navs took the lead for good in the bottom of the 7th inning when BC catcher Garrett Smith dumped a two-run double. Read the full article from the Lynn Daily Item. 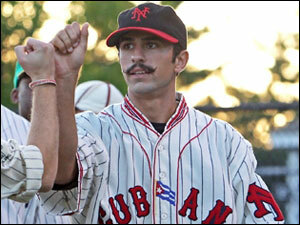 Nick Tropeano pitches Kettleer shutout innings. (Daily Item photo / Reba M. Saldanha). 8/07/10: The Boston Men's Baseball League held their 2010 MABL and MSBL All-Star Games today at LeLacheur Stadium in Lowell for the 10th straight year. LeLacheur is home to the Lowell Spinners, Single A Affiliate to the Boston Red Sox. National 15, American 4, MSBL: The National League team, featuring a Heisman Trophy winner in Doug Flutie and a former Major League pitcher in Kevin McGlinchey, pounded out 17 hits and 15 runs on their way to beating the American League All-Stars. The hit parade was lead by Doug Flutie, George O'Conner and Dana Levensaler who each had 2 hits. Levensaler, who was also an MABL All-Star, led the team in RBIs with 3 followed by Rob Linn, Flutie and Stan Demartinis with 2 a piece. Tom Dowey pitched 3 innings of middle relief to pick up the win and Kevin McGlinchey pitched the ninth. Atlantic 6, Bay State 2, MABL: Bay State took a 1-0 lead into the 9th inning. It was then that Atlantic bats came to life with 6 runs started by a hit by Eric Fuderman. Adam del Rio knocked in the tieing run with his 3rd hit of the game. Julio Gonzales, Anthony Tomoro and Steve Vaneeran also had RBI hits in the inning. Steve Shaw picked up the win pitching a scoreless 8th. Del Rio was the offensive star for Atlantic going 3-4 with an RBI. For the Bay State, Mike Cook struck out side in the 3rd while consistantly breaking 90mph on the gun. Dana Levensaler strokes a hit for the Nationals. 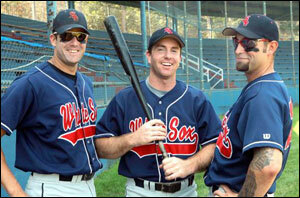 Doug Flutie reaches for the MSBL All-Stars. 8/02/10: A professional amateur is a guy who is an amateur baseball player for life. 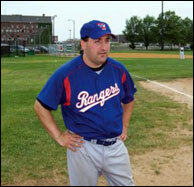 Nobody is that more than Steve Pinner, currently playing and managing the Boston Rangers in the Boston Men's Adult Baseball League. 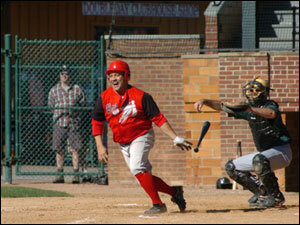 The Men’s Adult Baseball League was founded in 1993. Only one player remains in the league from that inaugural season: Steve Pinner. During Pinner’s 18-year MABL career, he has played with 11 different teams. Pinner’s desire to seek out more baseball, year after year, is what amateur baseball is all about. The following is Pinner’s first-person account of his eventful baseball career. Read his full story in the New England Baseball Journal article. THESE KIDS ARE STATE CHAMPIONS! 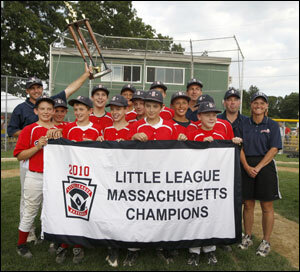 7/31/10: From Little League to American Legion, we have our Massachusetts State Champions! East Longmeadow Post 293 ousted Milton Post 35 by a score of 11-3 behind the pitching of hurler Steve Moyers to complete a doubleheader sweep for the 2010 Massachusetts state American Legion baseball tournament title at Campanelli Stadium in Brockton. East Longmeadow (24-3) will represent Massachusetts at the New England Regional tournament in Middletown, CT beginning August 5. Read the full article in Mass Live. The Southborough Little League team defeated the storied Peabody Western program 10-4 in six innings, capturing their first ever state Little League title and advancing to the Eastern Regional in Bristol, CT. Watch the Channel 7 TV segment. Mike Ahmed congratulates Ken Morrisino. (Republican file photo by Dave Roback). 7/31/10: Franz Strassman, the coach of Grossman Marketing, has his team fighting for a playoff spot in the Boston Park League. This is a great story on the oldest continuing amateur baseball league in the country. Below, Jim Murphy, a retiree from West Roxbury, enjoyed a free front-row seat for a game at Fallon Field in Roslindale. Read the full article from the Boston Globe. 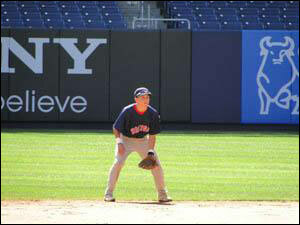 7/29/10: Patrick Ruotolo (16yo) and Nick Turco (13yo) of Peabody played at Yankee Stadium for the Boston RBI (Reviving Baseball in Inner Cities) sqad. Read the full article from The Daily Item. 7/29/10: In the Cape Cod League All-Star Game, the West beat the East,5-0, before 10,470 fans at Fenway Park. For many amateur ballplayers in the game, this may not be their last chance to shine on a professional field. Below, Zach Wilson of the Wareham Gatemen slips safely into home ahead of the tag by Yarmouth-Dennis catcher Joe Pavone. Wilson was named MVP for the West. Read the full South Coast Today article. 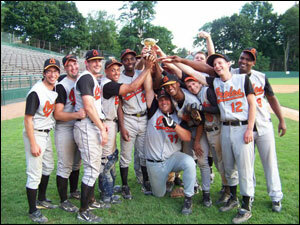 7/25/10: The Boston Renegades Beep Baseball are the Beasts Of The East, having defeated Long Island, 13-3 in the Finals. This was the first ever Blind baseball tournament in New England as teams from Long Island, New Jersey, Pennsylvania & Boston competed. Required to wear a blindfold so every player is equal, Boston Renegades' Joseph Ward (below) hits. Read more from the MetroWest Daily News. 7/19/10: The Braintree White Sox won the 2010 Cranberry League Championship. The White Sox held off the Foxboro Knights 1-0 behind a shut out from CBL Pitcher of the Year CJ Hillyer at Rockland Stadium. Fives CBL teams will now play in the upcoming Stan Musial Tournament. 7/15/10: Led by pitcher Bo Gillette, the Orioles went 4-0 in this year’s 7th annual tournament to secure their first Cooperstown Classic title, ultimately outlasting a tough Ben’s Dream White Sox team in the finals by a score of 8-6. 7/15/10: The Canada Junior National Baseball Team, a team of 16-18 year olds, battled the New Bedford Bay Sox of the New England Collegiate Baseball League. The Bay Sox won the game 2-0 in 7 innings. New Bedford's Stephen Wells slides safely into second base with a steal when Canada's Justin Atkinson cannot hold onto the baseball during Wednesday's exhibition game at Walsh Field. Photo left from Mike Valeri/The Standard-Times. Read the full article from the South Coast Today. The sweet-swinging Pena, a 22-year-old Fisher College graduate, has cemented his name as an MVP candidate with half a season to go. Heading into the holiday weekend, the native of the Dominican Republic was leading the league in batting average (.460), RBI (26), doubles (nine), slugging percentage (.740), and OPS (1.231). Not surprisingly, Pena, a catcher with an above-average arm, enjoyed a recent pre-draft tryout with the Mets at Citi Field, although he did not get drafted. Read the full article from the Boston Herald. 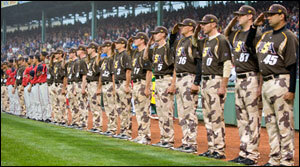 7/09/10: US Military All-Stars 16, Yawkey League 6. Revere's Lalliberte homered to cut the lead to 8-6 at one point, but the USA's Ross Blondin hit a 3-run homer to effectively put the game away. MVP Doug Flutie went 1-3, with 3 RBI for USA, and also closed out the game at pitcher in the 9th. Cranberry Baseball League All-Stars 2, Boston Park League All-Stars 1. In a rain-shortened game over the the Boston Park League All-Star team at Campanelli Stadium. The game was called in the top of the sixth inning. New England Baseball League All-Stars 10, Royal Rooters Baseball League All-Stars 9. Matt Prunier took MVP (3 for 3, 2 RBI, 2 SB, 2 IP, 2 K, save). Jason Encarnacao won the HR Derby. Eastern Division All-Stars 10, Estern Division All-Stars 0. In the 17th annual New England Collegiate Baseball League All-Star Game at Cardines Field in Newport, R.I., the West pounded the East. 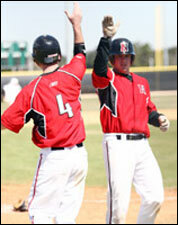 See College Baseball Blog recap. 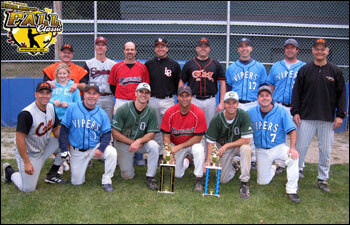 7/05/10: The 13th annual Downeast Wood Bat Classic was played 4th of July Weekend. The Southern Maine Men's Baseball League hosted this tourney in Portland Maine. 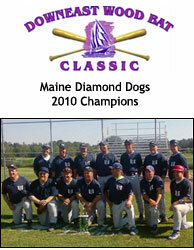 Fittingly, the Maine Diamond Dogs won the 2010 MSBL Downeast Classic, winning the championship game over the Seacoast MSBL 35s. Scott Ellis, of the BMBL was named tournament MVP. 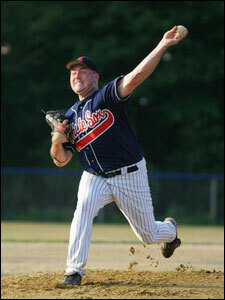 Last year's winner, the Medford Mets of the Boston MSBL, lost in the semifinals to Seacoast. The Boston Red Sox, in the 25+ bracket, also fell short in the championship game to the Rome Bombers. The North Andover Thunder also participated in the 35+ division. See all the Downeast scores. 6/20/10: The Amateur Athletic Union is a baseball network that enables kids to play against a wider range of competition than what they could get by playing on their town team. Kids sign up nationally, and are placed onto local teams that travel to play each other. Typically, AAU provides kids a higher level of coaching than town baseball, as the coaches tend to be former athletes, as opposed to parents coaching their child’s team. These kids get to work out at top-notch facilities, and play against the region’s top talent. Many AAU players also play baseball on their local town teams to supplement their travel baseball seasons. Marc DesRoches plays for the Somerville Alibrandis of the Yawkey League and Easton Huskies of the Cranberry League. He manages the AAU RBI Hawks. 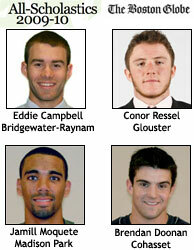 Read their stories in the New England Baseball Journal article. 6/28/10: At historic Doubleday Field in Cooperstown, New York, the MSBL Wayland White Sox took both games of a doubleheader over the Cambridge Cantabs, 8-6. See box score from Game 1 and Game 2. Eddie Campbell, Bridgewater-Raynam (D1) - A two-time All-Scholastic, Campbell hit .507 (with a .658 on-base percentage), slammed two home runs, knocked in 17 RBI, and stole 17 bases. 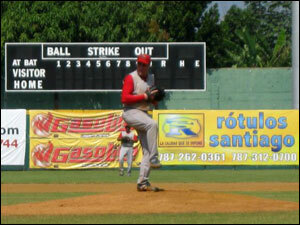 His real value came as a pitcher, going 7-3 with 119 strikeouts in 66 innings and a 0.64 ERA as the OCL co-MVP. Conor Ressel, Glouster (D1) - Ressel eviscerated opposing pitching, hitting .571 with two homers and 28 RBI after starting the season with 10 consecutive hits. The Northeast Conference MVP is one of the state's top running backs in football, a two-time hockey aall-star, and will attend UMass-Lowell in the fall. Jamill Moquete, Madison Park (D2) - This four-year varsity starter has been the catalyst of the two-time Boston City League champions. He hit .405 with eight homers and 29 RBI, all with an injured shoulder that kept the third baseman from playing his natural position. Brendan Doonan, Cohasset (D3) - Doonan anchored his champion team both at the plate (.330 batting average, 28 RBI), on the mound (6-0), and on the basepaths (21 stolen bases). He goes to URI with a .462 career average and has been a key player for the football and hockey teams. 6/20/10: State Championships for Division 1, 2, and 3 were held yesterday for Massachusetts high schools at LeLacheur Park, home of the Lowell Spinners, Single-A affiliate to the Boston Red Sox. 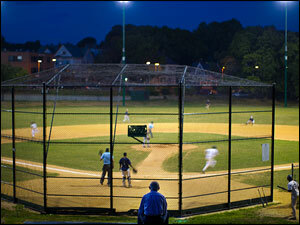 The Division 4 Championship game was held earlier this week at Frasier Field in Lynn. Ziomek K's 17, leads Amherst-Pelham to D-1 state title. Catcher Steffen Herter, who dislocated his left shoulder in the second inning, returned in the seventh and rallied the Hurricanes. Sean Cunningham hit a game-winning, two-run double in the seventh as Amherst- Pelham Regional beat Xaverian 3-2. Northbridge High baseball coach John Demagian finally got his jersey washed in the best way — while he was still wearing it. Demagian received a celebratory postgame soaking from his players after the Rams captured the Division 2 state title with a 3-1 win over Duxbury today at LeLacheur Park. A first-inning grand slam by Mike Twitchell and a 129-pitch effort by A.J. Bashaw led Norton to a 7-4 victory over Ware in the Div. 3 state championship game at LeLacheur Park. Three of Cohasset’s first four batters reached to load the bases. Jamie Faber then ripped a triple past diving center fielder Colin Smith to make it 3-0, and the floodgates were opened. Cohasset stunned underdog Matignon with 11 runs in the first inning leading to a 15-3 victory at Fraser Field. Division 3: The UMass-Boston Beacons lost to Linfield (OR), 12-0, on Friday May 28 and to University of Wisconsin at Stevens Point, 13-3, on Saturday to get elminated from the Division 3 College World Series. Division 2: Franklin Pierce was eliminated from the CWS semifinals with a 6-3 loss to California-San Diego. Division 1: Boston College finished 1-2 in the ACC Tourney. The highlight was Game 2 vs. Miami where after overcoming a 10-5, 9th inning deficit, BC won 12-10 in the 12th inning on a walk-off homer by Andrew Lawrence. The Eagles were not selected for the NCAA Tourney when the 64-team bracket was announced today. 5/25/10: The College World Series is about underway, and just one local college remains from each of Divisions 1, 2 and 3. Division 3:Tim Fontaine hit a go-ahead two-run home run as part of a five-run fifth inning to propel the seventh-seeded UMass Boston Beacons baseball team over top-seeded Tufts University, 12-6, to capture its first-ever NCAA New England Regional Championship at Eastern Baseball Stadium in Mansfield, CT. The Beacons have won a school-record nine straight games and 15 of their last 17 to improve to 32-15 on the season. Division 2: The Franklin Pierce Ravens (NH) lose their first Series game to Kutztown (PA) in the bottom of the 12th inning. Though Jose Macias did not allow an earned run over eight innings against Kutztown on Sunday, junior Brett Wigder blooped a single off Brian Maloney to give his team a 2-1 victory. With the loss, Franklin Pierce falls to 41-16-1 and face elimination. Franklin Pierce will play Minnesota State at Cary, NC at the USA Baseball National Training Complex at 3:00PM on Tuesday, May 25 in the Division 2 College World Series. Division 1: The Boston College Eagles team have earned the eighth seed in the 2010 ACC Championship and will face top seeded and top ranked Virginia in the opening game of the tournament on Wednesday, May 26 at 12:00PM at NewBridge Bank Park in Greensboro, NC. As the eighth seed, the Eagles have been placed in Division A with the Cavaliers, fourth-seeded Miami and fifth-seeded Florida State. Division B consists of No. 2 Clemson, No. 3 Georgia Tech, No. 6 Virginia Tech and No. 7 NC State. 5/02/10: On Sunday, Brian Baudinet carried the UMass Minutemen to a series-clinching victory over George Washington, becoming the first player in over 130 years of UMass baseball to hit four home runs in a single game. Baudinet drove in half of UMass' runs in the 14-13 win, going 5-for-5 in the contest and scoring four times. His record-setting homer in the eighth proved to be the deciding run. He was then named co-Atlantic 10 Player of the Week and is one of the Louisville Slugger National Players of the Week, according to Collegiate Baseball Newspaper. Take a peek! 4/07/10: The Brockton Rox will be hosting the Beanpot tournament at Campanelli Stadium once again in 2010, with the baseball teams from Boston College, Harvard, Northeastern and UMass Amherst participating in the two-day event.The teams will each play one game on Wednesday, April 14 and Wednesday, April 21. Purchase tickets to the Beanpot Tourney. BC plays in the ACC and is 12-15, Harvard plays in the Ivy League and is 8-14, Northeastern plays in the Colonial Athletic Conference and is 6-12, and UMass Amherst plays in the Atlantic-10 and is 2-15. Last year's Beanpot Title was captured by Northeastern. 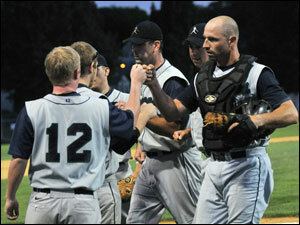 3/27/10: Welcome to the Diamond Baseball League, who begins play in 2010. The new league has 8 teams across the South Shore playing doubleheaders each Sunday. Teams hail from teams from Brockton, Easton, Middleboro, Taunton, East Bridgewater, Dorchester, Avon, Quincy, Randolph and Boston. The league is actually a restructuring of the former Massachusetts Independent Baseball League, which is now defunct. Learn more about the Diamond Baseball League. 3/17/10: New England Cable News ran a "Detour" segment featuring various BABN members. Anchor Chris Talanian is excited that the weather is warming up and that baseball is back in Beantown. With ball on the brain, he heads over to the South Shore Baseball Club in Hingham. President and CEO Frankie Niles is there to help Chris get back in the baseball form. Then, with his swinging down pat, Chris goes to Brockton to James Edgar Playground. Chris knows that defense wins championships and with the help of the Brockton Reds and Frank Alexopoulos, President of the Massachusetts Independent Baseball League, he could be well on his way to getting a championship ring! 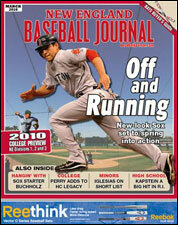 3/07/10: Have you read New England Baseball Journal yet? They are new to the Boston Baseball Community and have monthly coverage on amateur, high school, college, minor league and Major League Baseball. Magazines are free at batting cage locations and $3.99 at newsstand. 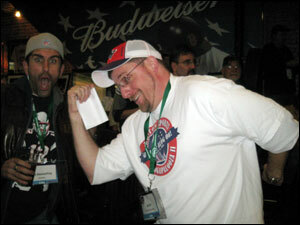 The Boston Amateur Baseball Network's Brett Rudy will be contributing a column each month. Read the first column on local amateur leagues coming together. The article includes interviews with Park League president, Walter Bentson, Massachusetts Independent Baseball League president, Frank Alexopolis, and Boston Amateur Baseballers' Union president Dan Weldon. Other amateur coverage this month includes a 2010 New England College Preview of Division 1, 2 and 3, as well as coverage of high school baseball. Next month's Boston Amateur Baseball article will focus on how successful managers prepare for their season, with interviews from two managers who know how to win league titles. Visit http://www.baseballjournal.com. 2/20/10: Hall of Famer Cal Ripken, Jr. hosted a clinic for adult amateur baseball coaches and enthusiasts at Milton High School. Cal Ripken, Jr. was joined by his brother Billy, and former MLB pitcher John Habyan. The day began with a VIP Breakfast where Cal detailed the experience of his Ripken Baseball Camps in South Carolina and Maryland. The remainder of the day was filled with interactive clinics on pitching, hitting and defense - all the Ripken Way. Mike Moyer of the Boston Braves was the Boston Amateur Baseball Network lucky winner of a breakfast with Cal. When the clinics began later that morning, many amateur athletes got to participate. Ryan Bere of the MABL Blue Jays & Yawkey League Cyclones got to participate in fielding exercises, while Earl Murphy of the MABL Tigers got to take some soft-toss with Billy Ripken with tips from Cal. The event concluded with autographs and one-on-one conversation with the MLB stars, Cal, Billy and John. (Billy even admitted that his controversial 1989 Fleer baseball card was indeed staged!) The day was truly a best-in-class event, and the clinic was top notch. See event photos here. Below, you can see the Ryan Bere's interview with Cal Ripken, Jr., where they discuss his camps, clinics and amateur baseball. 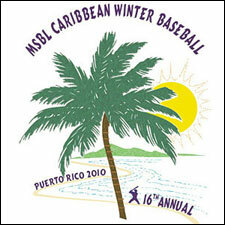 You can also watch Earl Murphy of the MABL Tigers take soft toss from Billy Ripken while being critiqued by Cal Ripken, Jr.
2/15/10: Three teams from the Boston Men's Baseball League competed in the 16th Annual MSBL Caribbean Winter Baseball Championship in Puerto Rico beginning over Valentines Day weekend. 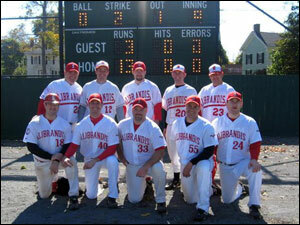 The Rhode Island Cardinals won the 35+ division, going 5-0 in pool play and sweeping the playoffs. Congrats! The New England Bandits and Dorchester Dodgers each went 1-4, also representing Boston in this 5-game stadium tournament played in Puerto Rico. 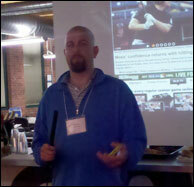 2/12/10: Last evening, Grip N' Rip hosted the largest amateur baseball league event to ever come to Boston in an effort to bring the baseball community together and raise funds for Kevin Youkilis Hits for Kids. More than 200+ adult ballplayers were in attendance. Amongst the guests were the leadership of many amateur baseball leagues, including Kyle Provost of the Royal-Rooters Baseball League who oversaw the event raffle, Walter Bentson, president of the Boston Park League, Dan Weldon, commissioner of the Boston Amateur Baseballers’ Union, Frank Alexopolis, new president of the Massachusetts Independent League, Vinny Bertrand of the Boston Amateur Baseball League and Matt Englander of the Boston Men’s Baseball League. Booths were set up for a dozen baseball businesses, including Barnstable Bats, Glove Inc., SupahFans Streetwear, and Checkswing.com - to name a few. 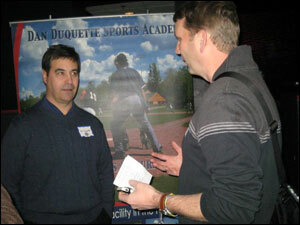 Former Boston Red Sox GM, Dan Duquette was on hand to answer questions on all things baseball. Participants also had a chance to hit in a Boston Red Sox' visiting team batting cage at Fenway Park. Read the article Boston Sports U18 wrote on the event. 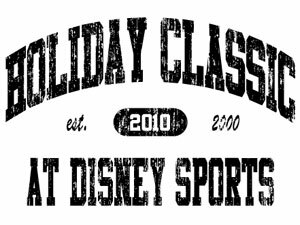 1/17/10: Three teams from Boston played in Florida over MLK Weekend to compete in the 11th Annual MSBL / MABL Disney Holiday Classic. In pool play, the Boston Wolfpack went 3-0 in the 45+ Division, the Boston Braves went 0-4 in the 35+ Division, and the Boston Cutters went 2-1 in the 18+ Division. 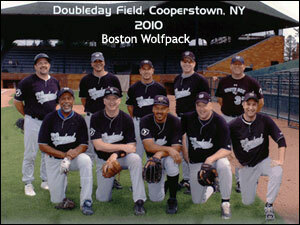 The Wolfpack became Age 45+ Champs for the 5th time, defeating the San Antonio Brewers, 3-0 in the Finals. The 'Pack defeated the Orlando Blazers 15-1 in the Semifinals after going 3-0 in pool play with wins over the Atlanta Braves 9-3, the Orlando Blazers 12-4, and the LA Crude 18-3. In the Age 18+ Division, the Cutters advanced to the playoffs, where the were defeated 13-10 in the semifinals by the Tampa Bay Shockers. The Shockers had also beaten them in pool play, 5-1. 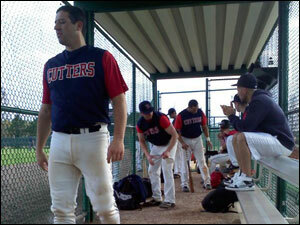 The Cutters had previously defeated the Philadelphia Yankees 22-1, and the Orlando Padres 9-5. Tony Ramos was the standout, having launched a grand slam. 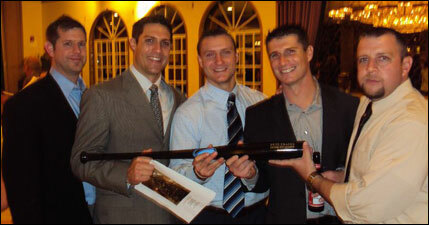 1/09/10: It was a philanthropic day in Boston as Red Sox players were all over town giving back to the community. In the morning, the 5th Annual New Stars for Young Stars event ran flawlessly at Jillians to benefit the Jimmy Fund. This autograph-signing event provided a unique and memorable opportunity to meet and greet some current and former players, such as Manny Delcarmen, Josh Reddick, Curt Schilling and Trot Nixon. See more from the Boston Herald's Inside Track. Then that evening, the 10th Annual Hot Stove Cool Music event was held at House of Blues to benefit the Foundation To Be Named Later. In the house were State Radio, Tinted Windows, Low Anthem, Theo Epstein, Peter Gammons and the Hot Stove All Stars with Bill Janovitz, The Dropkick Murphy's Ken Casey, Letters to Cleo's Kay Hanley, Bronson Arroyo, Mike O'Malley. 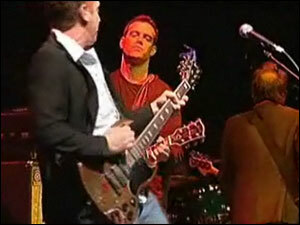 Watch a short clip of Theo jamming on WHDH. Manny Delcarmen cues up at New Stars for Young Stars. Sox GM Theo Epstein rocks out to some cool music.